Earlier this week, Overwatch’s Bastion buff went live and, as usual, the sky fell. Players were so devastated about the changes, and so vocal, that the game’s director Jeff Kaplan just said he’d roll them back, a little consolingly. But two days post-patch, did players really have enough time to develop workable strategies to counter the apparent monster? 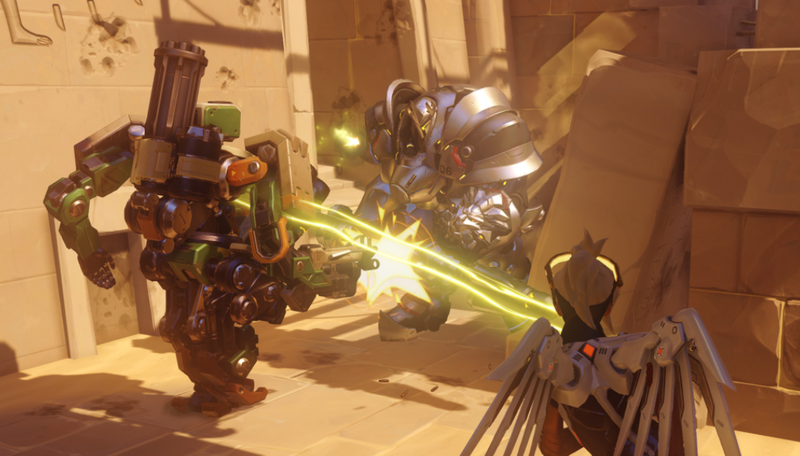 Bastion received a huge boost on Tuesday after a few weeks of testing on the PTR. It’s formidable now, finally a respectable defense hero who requires coordination to counter. In recon mode, Bastion can heal on the go, although his bullet spread is more narrow, his magazine size is larger. Switching to sentry mode takes less time, and in that mode, Bastion’s magazine size is larger, with a larger bullet spread. Also, Bastion is now “ironclad,” taking 35% less damage in sentry or tank mode. Essentially, Bastion has become more flexible, durable and deadly. With the boost, Bastion can survive powerful ultimate attacks by healing through them or moving quickly out of the way. It can mow down Reinhardt’s shield in a matter of seconds. And, more damning, a Mercy-Reinhardt-Bastion triad is a fierce adversary. Bastion’s become a near-necessary pick in the days after the buff, something Overwatch players attribute to its apparent irreverence for balance. Kaplan added that he’d had an experience he’d considered unfair last night while taking Bastion out for a spin. A skilled Tracer player focused him. He leaned on his self-heal and ended up besting that Tracer in recon mode, despite her being a better player, in his opinion. That convinced him that some players’ complaints were valid, and to make some changes. Overwatch players tend to react strongly to buffs. When Dva was nerfed, the sky was falling. Now, players have become more savvy using her shield. When Roadhog’s Hook 2.0 was released, the sky was falling. Now, even after his recent nerf, players have learned to be more judicious about their hook attacks. Even the release of Ana was met with fear and panic. It’s no news that Overwatch players are precious about the game’s balance—as they should be, because it’s asymmetric. But adaptability is key for a live, online game. Bastion’s buff could be an exciting opportunity to adapt to the new meta, not the end of the world. Can’t go after Bastion on your own anymore? Bring a tank with you. Hit Bastion with a Discord Orb and send Sombra in. There are ways to counter it, and they will take coordination, Overwatch’s greatest asset, to discern. I suffered some gnarly deaths-by-Bastion in competitive mode last night, especially on the Anubis map. It forced my team to think more strategically. I trust Kaplan’s assessments on Overwatch’s balance. With that said, players should scale back the impulse to immediately burn a new, developing meta to the ground. Time spent complaining about Bastion’s changes on social media could be spent forging new strategies. I was really excited to see how teams would overcome it.